Die cast & steel rod. Visual-pack. 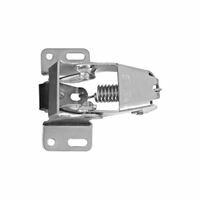 Heavy steel with extruded bearing in housing and rocker arm - assures smooth action. Includes screws. Designed to hold screen and storm doors shut. Closing action of door engages catch and releases strong steel spring. Spring tension closes door and holds it in shut position. Steel frame and spring with rubber roller.